My bedroom makeover is well underway now. The green headboard has been replaced, new curtain sheers are in place, the side table is being painted and a new duvet cover has been purchased...it's still white though, no change there. The color scheme I am working around is from a pair of Hot House pillows that were graciously given to me by Kristine over at Living with Style. 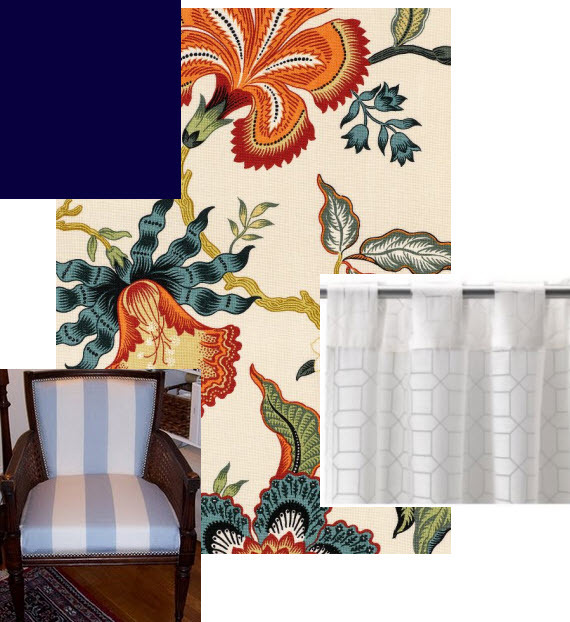 Now comes the challenge of finding coordinating fabric and curtains on a budget. I seem to have champagne taste on a beer (think Ice House beer that is) budget. The beer budget is because I tend to change my mind with the wind. This is the second, or third time I have redecorated my bedroom in two years and its surely not going to be the last. The details so far: the head board is navy , the curtain sheers are a bright white, the blue and white striped chair I recovered is in there and the Hot House pillows are in place on the white duvet. Now the hunt is on to find curtains- any color suggestions? and coordinating fabric for big pillows- any suggestions? I also have to finish painting my dressers white, finish the paint treatment I am doing on the side table and to get the room put back together. I took tomorrow off to get some of this stuff crossed off my list. Am I crazy for doing that? Yes. But what can I tell you, I'm a girl obsessed with decorating and will go to great lengths to be able to do it. PS- don't forget about the Drinks on me Giveaway- its a fabulous prize so get in your chance to win by Sunday at midnight! Hot House Flowers is so great. And that colorway looks so YOU! I love a stripe with florals, thought about that? Jennifer, I totally forgot that my striped chair is in there too! Thanks for the reminder about stripes, I just updated the post with the chair now- thank you!! It sounds really good so far! Really crisp with punches of clear colors!! I'm not sure what to tell you about pillows and curtains.... I would probably wait until I had it all in there to see what I thought it "needed". But at first thought, I'd probably use orange pillows - but that's because I love orange!!! ;-) Maybe orange pillows and navy curtains? Can't wait to see it all re-done! You had me at Hot House Flowers! It sounds fantastic! I would throw more color on the bed...bring in orange. Love orange! Yeah, I say bring in some orange too! I LOVE that fabric! I used the same blue striped fabric on a set of french chairs! I love that print! I'm sure it's going to be really a lovely room once all pulled together-- can't wait to see photos! what a gorgeous cushion, amazing, congratulations! What about the same color olive that's in the pillows, on the stem? I love that floral fabric on the pillows! I agree with everyone else saying bring in some orange! I like it all. Love stripes and florals mixed. And Navy, yum. I'm coming over soon to see it! Anything you do will look stunning, I'm sure! Ohh it all sounds great, i can't wait to see! Ahh I just love home projects!!! What a great fabric! I agree that some orange would look great in here! I am in love with that pattern...so great! And I adore the nail head trim on that chair!! I am soo stuck on my bedroom right now, one of the rooms we have not tackled yet and it just seems to have a hodge podge of everything and anything in the room! I heart your striped chair. That pillow also is fabulous with all the colors! Didn't change a thing yet because i'm scared. still owe you an email! Meg's more our home decor expert, so no advice from me...but I'm totally diggin' your color palette lady! oooh so excited to see how it turns out! Agree with some orange! and fabulous fabric. 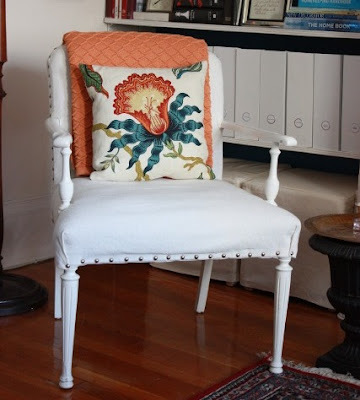 Love that chair and pillow, can't wait to see the end results!